Greetings from St. Mark’s softball team! Our 2014 regular season including tournament is now over, and as noted previously, we ended up with a third place finish (season) and had two wins and two losses for the tournament! 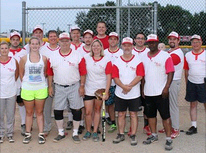 At the start of the season we lost one of our six teams in the Recreation League this year (Freedom Church) and so were faced with playing with an odd number of teams. That would have meant playing a “bye” every so often and more schedule confusion. However, we were able to pick up a true mixed league team called “Tickets” (5 guys and 5 gals) who have joined us. Once again, many thanks to our extraordinaire coaching staff comprised of Tracy Hall (manager) and Don Nancarrow (coach and assistant coach / chief statistician) for all their hard work in leading us yet another year!